In The Jungle Theater’s newest production And the World Goes ‘Round, a musical revue featuring the songs of Kander and Ebb, we are treated to an eclectic collection of love songs, torch songs and witty comedic numbers. Originally conceived by director Scott Ellis, choreographer Susan Stroman and librettist David Thompson, And the World Goes ‘Round debuted off-Broadway in 1991. 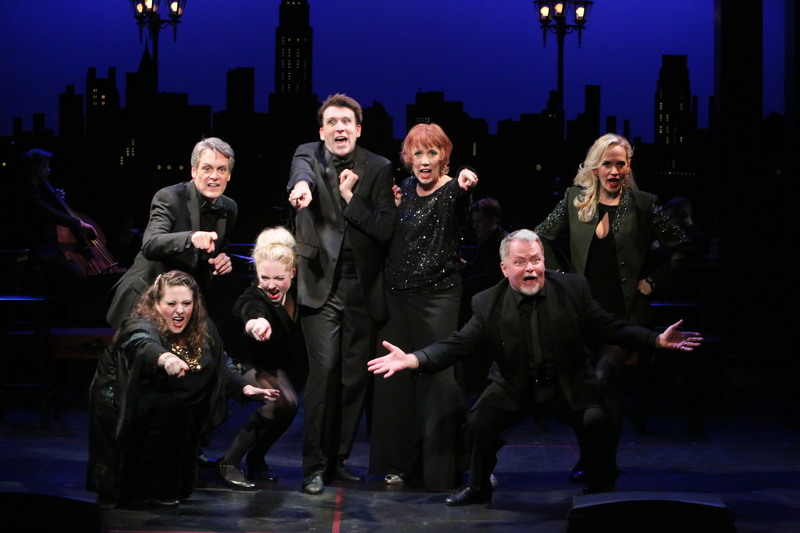 This revue honors the songwriting team of Kander and Ebb who forged one of the longest-running and most successful creative partnerships in Broadway history, their bold, brassy style gave way to a series of widely popular and provocative musicals including Cabaret, Chicago and Kiss of the Spider Woman. Under John Comand’s direction and Christine Fournier’s choreography some of Broadway’s biggest musical numbers come to life on The Jungle Theater’s stage. As John Command mentions in his letter to the audience in the program “Liza Minnelli once stressed to perform every song as if it were a one-act play”. This philosophy is evident in this production as every cast member gives it their all on every number. Audience favorite Bradley Greenwald gives a stunning performance of “Kiss of the Spider Women” and a heart-wrenching performance of “I Don’t Remember You” from The Happy Time. Tiffany Seymour, Emily Rose Skinner, William Gliness and Bradley Greenwald lend a comedic turn to “The Grass is Always Greener” from Woman of the Year. The entire cast shines in “Ring Them Bells” from Liza with a Z, “Coffee in a Cardboard Cup” from 70, Girls, 70, “And All That Jazz” from Chicago, “The Money Song” and “Cabaret” from Cabaret. And the World Goes ‘Round is playing at The Jungle Theater through May 24. For more information on And the World Goes ‘Round and to purchase tickets, visit The Jungle Theater’s website.